Frederick Dowie was born at Unagh, Lissan, Cookstown on 11th July 1890. Little is known of his parents. 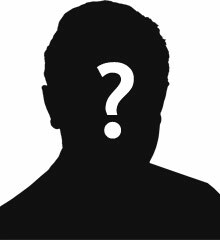 He and his brother grew up with the McKinneys, who were relatives. Both William and Fred were farmers. Fred Dowie was a member of Ballybriest L.O.L. Fred Dowie enlisted in Glasgow. 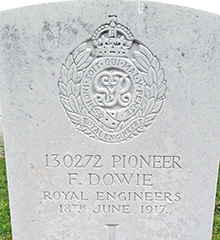 Private Dowie served with the Royal Inniskilling Fusiliers for a time (No. 4/28003). He was serving with the 2nd Special Company of the Royal Engineers seriously wounded at the Battle of Messines on Saturday 9th June 1917. Private Frederick Dowie died of wounds nine days later at a base hospital in Calais on Monday 18th June 1917. Calais Southern Cemetery is a civil cemetery lying on the south of the old main road to Dunkerque. Follow the A16 autoroute from Calais to Dunkirk. Come off at Junction 48 in the direction of Marck and follow the road to the junction. Turn left into Calais at the junction and follow Avenue de Calais D940) for approximately 3 kilometres and then straight on to Avenue de st. Expuréry. The Communal Cemetery is on the left hand side of the road, 50 metres after the traffic lights. To find the Commonwealth War Graves, proceed along the main pathway to the rear left hand side of the Cemetery.